* A blank space on the recording date means that the box was empty. 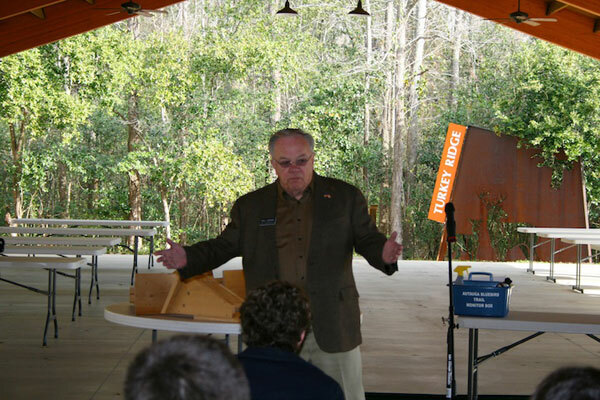 On February 13, members of the Autauga Bluebird Trail committee met with Stanhope Elmore High School's advanced biology students at the Alabama Wildlife Federation in Elmore County. The field study being conducted by the Alabama Nature Center with these students will have them monitor the bluebird houses and provide data to the Autauga Bluebird Team for inclusion on their website, www.autaugabluebirdtrail.com. Representative Mac Gipson came out and spoke to the group. He welcomed them and commended them on their iniative. Mac also talked about the history of the trail and the funding he was able to procure to get it off the ground. The Autauga Bluebird Trail is very grateful to Gipson for his time and efforts which have made a huge difference in this project. Tommy Pratt, president of the River Region Birding Club and committee chairperson for the Autauga Bluebird Trail, organized the meeting and the presentation by the committee. 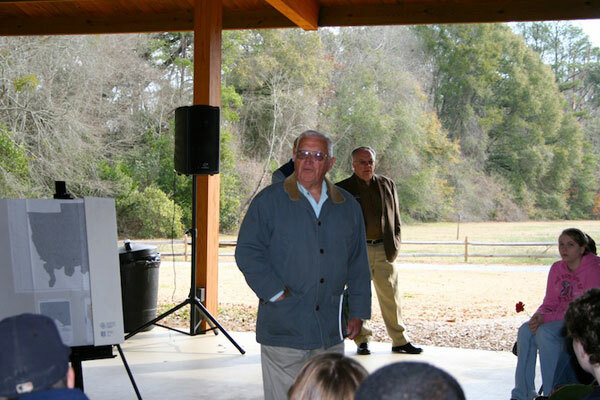 Tommy Pratt and Mary Ray gave a history of the Autauga Bluebird Trail and how it came to be. 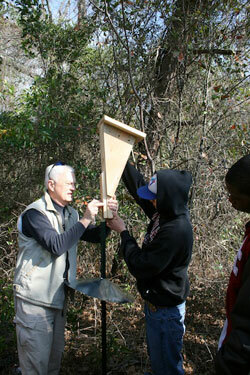 Both Tommy Pratt and Rod Douglas (the team's head monitor for Elmore County) demonstrated to the group of students how to assemble the bluebird houses, erect them, and finally monitor them. Autauga Bluebird Trail's webmaster, Teresa Lee, explained to the students how to deliver their data so that it could be included on the website. The morning's gathering ended with the students splitting up into teams as they assisted in erecting the ten additional bluebird houses for a total of 14 at the Alabama Wildlife Federation (Lanark). The Autauga Bluebird Trail now has several locations in Elmore County: Lanark, Bass Pro Shops, Mercer Road, Quail Walk Country Club, the City of Wetumpka, Wetumpka High School, Redland Road and Jackson Lake. The Trail has also moved into Coosa County with bluebird houses now located in Equality. It is exciting to see the trail grow into surrounding counties. When it was started as an Autauga Leadership Class project, the intention was for the trail to cross the state and become a tourism draw to Autauga County, the City of Prattville, and the rest of the state of Alabama. If you'd like to get involved with the Autauga Bluebird Trail, please contact Tommy Pratt.